Voters include past inductees and a panel of baseball experts; Hall recognizes players, executives, journalists and entertainers of Irish descent. This year's voters have their work cut out for them with such a diverse group of nominees who have put their stamp on the game of baseball. The Irish American Baseball Hall of Fame (IAB HOF) today announced the names of the nominees on the 2013 induction ballot. They include: popular former Mets Rusty Staub and Joe McEwing; Big Ed Delahanty, whose lifetime .346 average ranks fifth all-time; Peter O’Malley, longtime owner of the LA Dodgers; late night host Jimmy Fallon, star of “Fever Pitch"; and Charlie Sheen, who starred in Major League, Major League II, and Eight Men Out. Results of the voting will be announced in April. 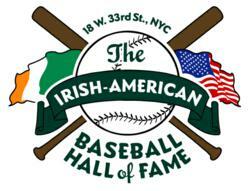 The induction ceremonies will take place at Noon on Tues, May 7, 2013, at Foley’s NY Pub & Restaurant (18 W. 33rd St.), which houses the Irish American Baseball Hall of Fame. Voters include past inductees into the IAB HOF and a panel of baseball historians. Joe McCarthy: Yankees all-time leader in managerial wins (1,460), won seven World Series titles between 1931-46. Doris Kearns Goodwin: First female reporter to enter the Boston Red Sox locker room, consulted on and appeared in Ken Burns's 1994 documentary, Baseball. “This year's voters have their work cut out for them with such a diverse group of nominees who have put their stamp on the game of baseball,” said Shaun Clancy, owner of Foley’s, which features one of the country’s most extensive public displays of baseball memorabilia outside of Cooperstown. "Each of these former players, scouts, managers, owners, journalists and entertainers have contributed something positive in their own way." With the blessing of the Baseball Hall of Fame, Foley’s, a popular destination among baseball players, executives, umpires and fans, created the Irish American Baseball Hall of Fame to recognize players, managers, executives, journalists, and entertainers of Irish descent. Inductees are chosen based on a combination of factors, including impact on the game, popularity on and off the field, contributions to society, connections to the Irish community, and, of course, ancestry. Shaun Clancy, an amateur baseball historian, created the Hall after learning about the rich heritage of Irish Americans in the sport dating from its infancy – a legacy overshadowed in recent years by other ethnicities. He decided to celebrate his roots and those who helped make the game great by creating a shrine to Irish Americans in baseball in 2008. The “Starting Nine” inductees in 2008 were: the late Mets and Phillies reliever Tug McGraw, Yankee announcer John Flaherty, sportswriter Jeff Horrigan, NY Mets groundskeeper Pete Flynn, retired sluggers Mark McGwire and Sean “The Mayor” Casey, Kevin Costner, star of Field of Dreams and Bull Durham, legendary owner-manager Connie Mack, and longtime official scorer and sports columnist Red Foley. 2009 inductees: Walter O’Malley, longtime Brooklyn and LA Dodgers owner (Executive category); sluggers Steve Garvey and Paul O’Neill (Players category), Jim Joyce (Umpire); veteran sportscaster Vin Scully, and Ed Lucas, a blind reporter who has covered the Yankees and Mets for four decades. 2010 inductees: Tim McCarver, veteran TV analyst and former player; Bob Murphy, longtime Mets announcer (Media category); Michael “King” Kelly, the game’s first superstar (Hall of Famers and Legends category); Yankees GM Brian Cashman (Executives category); Bill James, famed statistician and an advisor for the Boston Red Sox (Executives category). 2011 inductees: Nolan Ryan, baseball’s all-time strikeout king, Big Ed Walsh, baseball’s all-time ERA leader, legendary New York Giants manager John McGraw, New York Yankees trainers Gene Monahan and Steve Donohue, "Baseball's Balladeer” Terry Cashman, and Chuck Lennon, former player, coach and lifetime fan of Notre Dame Fighting Irish baseball. 2012 inductees: Jimmy Breslin, author of Can't Anybody Here Play This Game? ; Tom Kelly, two-time World Series champion manager with the Minnesota Twins; Gene Michael, former player, scout and GM responsible for building the modern Yankee dynasty; "Walpole Joe" Morgan, popular former player, scout and manager of Boston Red Sox; Jeff Nelson, longtime reliever, four-time World Series champion with the Yankees; "Wee Willie" Keeler, Dead Ball era legend; and Mike Roarke, credited with teaching the split-fingered fastball to Hall of Famer Bruce Sutter and a supporter in the development of baseball in Ireland. Foley’s NY Pub & Restaurant (18 W. 33rd St.) is home of the Irish American Baseball Hall of Fame. A popular destination among baseball players, executives, umpires, media, and fans, Foley's is located across from the Empire State Building. The "Irish Bar with a Baseball Attitude" features walls adorned with 3,000 autographed balls, bobbleheads, game-worn jerseys, stadium seats and other artifacts that make it the premier baseball bar in New York and one of the best sports bars in America. For more information, call (212) 290-0080 or visit http://www.foleysny.com or http://www.facebook.com/FoleysNYPub.